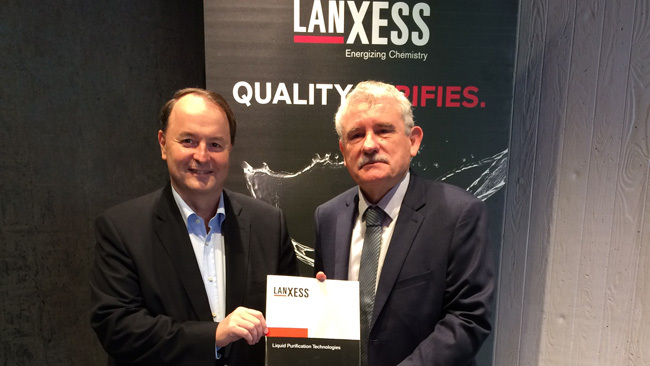 The Liquid Purification Technologies (LPT) business unit of the specialty chemicals group LANXESS has entered into a cooperation agreement with French company Polymem SA, Toulouse. One of the world’s leading manufacturers of high-quality ultrafiltration membranes and systems for drinking-water and wastewater applications will be the distribution partner of LANXESS in France for the Lewabrane reverse osmosis membrane elements. Starting on July 1, 2018, LANXESS will commence worldwide distribution of the Gigamem ultrafiltration modules range from Polymem featuring Neophil hollow fibre membranes. This adds ultrafiltration (UF) to the existing LANXESS range of water-treatment technologies. “We are gaining a product portfolio that ideally complements our ion exchange resins and reverse osmosis membrane elements for water treatment. After all, around one third of all newly built reverse osmosis plants have upstream ultrafiltration – and the trend is rising. This results in valuable synergy effects,” says Jean-Marc Vesselle, head of the LPT business unit. Ultrafiltration will soon be integrated as a new module in LANXESS’s LewaPlus design software. Ultrafiltration clarifies and disinfects water in one step. It is an alternative to conventional filtration in water purification, with a significant improvement in the effectiveness of the treatment, independent of the quality of the treated raw water and without the addition of chemicals. Ultrafiltration often replaces other conventional treatment techniques and microfiltration, as it can eliminate not only small particles but also pathogenic germs such as microorganisms, viruses, pyrogens, and some dissolved organic species. It enables the treatment of water with up to 300 mg/l suspended matter (TSS) in pressure-filtration operation and up to 15 g/l in suction operation (membrane bioreactors). Espenan emphasizes: “Our Gigamem UF modules are characterized by their high processing capacities. The UF240, for example, is the largest module available on the market and is of unmatched compactness. It combines all the advantages of filtration modules in terms of pressure filtration, high flow rate, easy maintenance and online integrity testing. These modules can be equipped with our hydrophilic Polysulfone membranes or our new durable hydrophilic PVDF Neophil membranes, all NSF61 approved”. Founded in 1997 and based in Toulouse, France, Polymem specializes in the development and production of membranes based on hollow fibres and membrane processes. The company manufactures filtration membranes and modules for water, wastewater, and liquid treatment in municipal, industrial, commercial, and private sectors. “Due to their experience in the field of membrane technology and their efforts to promote the use of membrane technologies worldwide, Polymem is an ideal distribution partner for us for the distribution of Lewabrane in France,” says Vesselle. The LPT business unit is part of LANXESS’s Performance Chemicals segment, which achieved sales of EUR 1.44 billion in 2017. LPT offers a comprehensive range of tailored ion exchange resins and RO membrane elements for a wide variety of applications in water-treatment.